This seems like it should be easy, but SSRS has nothing built in to allow you to do this. I searched an couldn’t come up with a solution that fit all my requirements for a report. There are ways to default the selection list to every value in the list, but I needed to add the option of ALL to my parameter list, default to ALL, and then most importantly have ALL show up in my header instead of showing every item in the list. I was determined to find a way, and here is how I did it. The first thing to do is add the value ‘ALL’ to your parameter query. You’ll want it show up at the top of your select list. A simple way to do this is to put a space before the A to make it sort to the top. Edit the where clause in your main query. If you are using Query Designer in Text mode, simply add this statement. Be sure to use outer brackets to contain both statements if you have other items in your where clause. I suggest you have your WHERE clause already complete before adding the OR, since the results can get confusing. You can use this method for cascading parameters where multiple parameters have the ALL value added. You’ll need to add the OR clause to your underlying parameter queries where applicable. For example, if you have a parameter preceding the Layout_Code parameter called Layout_Group you will follow the same steps above, plus an additional step to edit the Layout_Code dataset query. Edit your main query where clause to use @TopLayoutCode . Adjust the AND/OR in the WHERE clause accordingly. Edit your cascaded parameter query, in this case Layout_Code, to OR in the where clause. Adjust the AND/OR accordingly. Set the default value for each of your parameters, Layout_Code and Layout_Group, to the value ALL. Be sure to put a space before the A if you are using this method to sort your list in Step 1. Thanks for the feedback, Dave. Not sure why it didn’t work for you. When I type the ALL (with a space in front) it does work for me. Glad you found a workaround. I need to know how to just default to all the selections in the list or to the “(Select All)” that is already in the selection list of my parameter. Can you help me ? In the Parameter Properties of the Parameter you want set to (Select All) go to the Default Values tab. Set Dataset to the same dataset your values will be populated from. Set Value Field to the same value field your values will be populated from. It will now select all by default. I thought it would hang up since there is a parameter in the dataset but it doesn’t, it selects everything in the list. I hope this helps any one else with this issue. One point to add – if you find that RS is still not showing your default value as ‘Select All’, check your dataset associatedi with the multi-select valuesfor null values. If that dataset contains a null value, but your report parameter is set to not allow nulls, RS will revert to not selecting any values by default. Fix the DataSet with the ISNULL() operator so that it cannot return a null. The last paragraph was the missing information I needed. I fought hours trying to come up with a solution to the NULL issue. Very Good Job CSMatDSNT!!! IF that doesn’t work you may have to build the join statement in a new parameter and then reference the new parameter in your statement. I have followed the above and when I run my two data sets stand alone I get data back, but when I run them in the preview window, I do not get any results. They queries look good, and you say they each return results. When you say you run it in the Preview window, do you mean the Data Set window or the report Preview mode in SSRS? 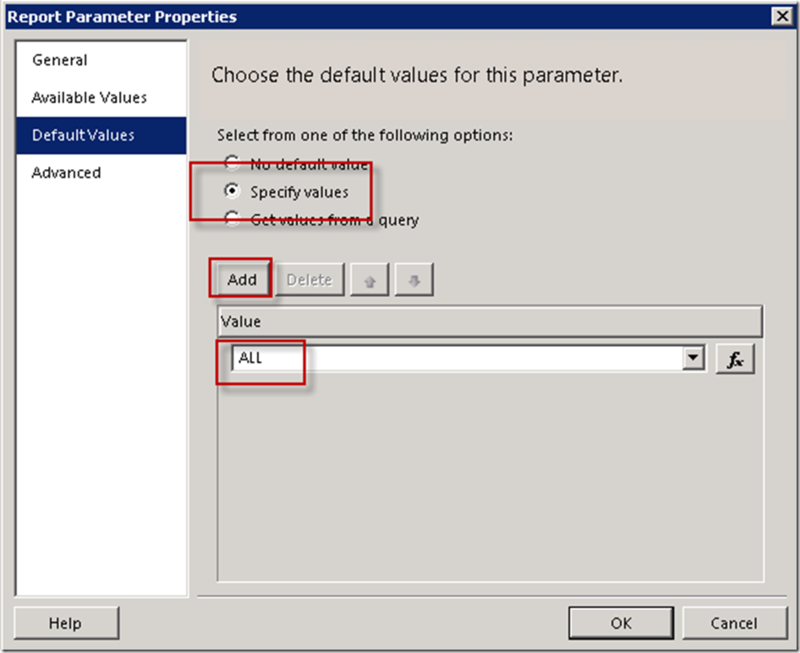 If it’s the data set, you must input a valid value for the parameter when prompted – ideally ‘ ALL’ (no quotes) since presumably that is what you are testing. If you are referring to the report Preview tab, did you apply the Parameter dataset to the Parameter as available values? Do you see anything in the parameter dropdown? Did you set the parameter default to ‘ ALL’ (no quotes) or leave it blank? If it’s blank you’ll need to select a value from the drop down and then click on the View Report button. Below query is not working…not sure what is wrong..
Hi Suresh, I don’t work with Sybase, but i would suspect it doesn’t like the format of the Join(Parameters.. statement. Try subbing in a hard coded list first and get your query working before sorting that out. Hi, what if you need to add a cascading to the code where the cascading is already set-up within the parameter, but not the main code? I have cascading parameters where i want to add a value “ALL” as select all option is not working when report is subscribed. The first parameter has label and value, I would like to know what should be the given in value column when I union a row “ALL” for label column. The value is what will be used in the main query, not the label. You will want the value to be ‘ ALL’, unless your values are numeric, in which case you will want to use -1 (if it doesn’t interfere with existing values) and adjust your main query where clause to look for -1 instead of ‘ ALL’. Hello, Thank you for the post. I tried it and it worked. But one thing is the parameter I am working on is dependent on date range parameters. Like when I change the date range, the Policyname parameter changes for that date range and I still want the report to show all the options to be ticked. Is there a way to accomplish that? Thanks in advance. I am working on SSRS in Visual Studio 2012. Hi Manasa, From your description it sounds like you have a cascading parameter, and you would like the prefiltered list of Policynames to be passed to your main query. If you really have the requirement to allow for the value of ‘ ALL’ in your parameter dropdown, I would probably create an additional hidden parameter for the prefiltered Policynames called @PolicyFiltered. Create a dataset for the available and default values for @PolicyFiltered filtered on the date range, and then feed the values of @PolicyFiltered to your main query instead of the value ‘ ALL’. it worked succefully for me . is it possible to create a cascading drop down list parameter even though I have only one table to query? If yes, could you please let me know how? Hi, Yes you can use a single table for this, however you’ll want to create separate queries for each dropdown so you only display a single value. For example a Region will have multiple entries for Canada in your table since the table houses data at a lower level than that. But your Country dropdown should only display Canada once. So you’ll want to SELECT DISTINCT COUNTRY FROM yourtable WHERE REGION = @Region as your query for the available values in the Country parameter. I hope that helps. I have an Doubt. I Set the Default value to ALL but my prompt is a float..i am getting error failed to Convert varchar to Float. Requirement: It needs to open field as user can search for Order Number and If user won’t select any thing it has to take default as ALL Order Numbers. If the value is a float, then instead of ALL try setting it to 0 or -1. TDQ – This worked as described and finally resolved an issue I struggled with all day! Thank you very much! You need to add ALL as an option in your main query in the WHERE clause in Step 2 of this post. Specifically WHERE (‘ ALL’ IN (@Layout_Code)) . If a user selects ‘ ALL’ in the dropdown then this part of the WHERE clause will select every line in the main query because ‘ ALL’ in @Layout_Code (the dropdown) will be true for every line returned.